As the MYP sciences roll into the Next Chapter and we mull over the new guides, objectives and assessment criteria, we have the opportunity to reflect on our assessment practices. 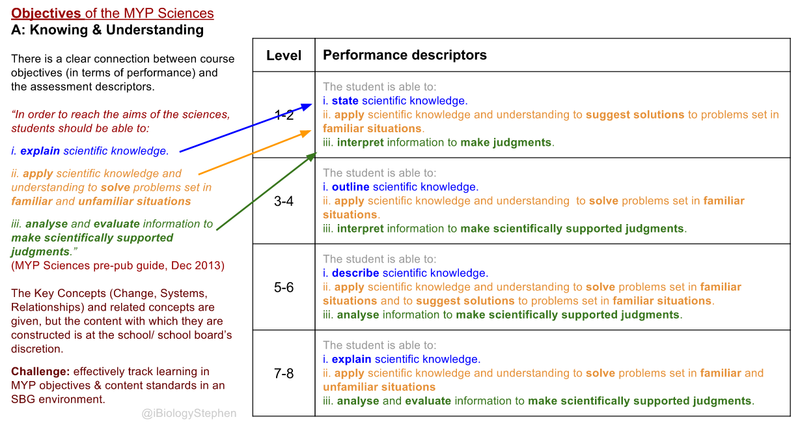 The IB have provided a very clear articulation between course objectives and performance standards (see image), which should make assessment and moderation a more efficient process. There is a clear connection between the objectives of the disciplines and their assessment descriptors in all subjects in MYP: The Next Chapter. Underpinning these objectives, however, are school-designed content and skills standards. These are left up to schools for articulation so that the MYP can work in any educational context and this is great, though it does leave the challenge of essentially tracking two sets of standards (or more) in parallel: the MYP objectives and the internal (or state) content-level standards. In a unit about sustainable energy systems, for example, I might have 15-20 content-level, command term-based assessment statements, each of which could be assessed against any (or many) of the multiple strands for each of four MYP objectives. If they score well on a task overall but miss the point on a couple of questions/content standards, have they really demonstrated mastery? How can I ensure that they have mastered both content and performance standards? If they learn quickly from their mistakes and need another opportunity to demonstrate their mastery on a single content-level standard (or performance-level standard), do they need to do the whole assignment again? What if time has run out or there is not opportunity to do it again? As we move through the calendar in an effort to cover curriculum and get enough assessment points for a best-fit, are we moving too superficially across the landscape of learning? More importantly, is the single number – their grade – for the task, a true representation of what they know and can do? How can I present this more clearly, to really track growth? My aim with all this is to encourage a classroom of genuine inquiry (defined as critical, reflective thought), in which I know that students have effectively learned a solid foundation of raw materials (the ‘standards’, if you will), upon which they can ask deeper questions, make more authentic connections and evaluate, analyse and synthesise knowledge. Lucky we have Rick Wormeli videos for reference. Here he is on retakes, redos, etc and it is worth watching (and provocative). There is another part, as well. If you haven’t seen them yet, go watch them before reading the rest of this post (the videos are better, TBH). What do I do already? Lots of formative assessment: practice, descriptors on worksheets, online quizzes. Each question is labeled with the descriptor level and strand (e.g. L1-2a, L5-6b, c). I don’t usually give a grade, though do check the work. Students should be able to cross-reference the questions with the descriptors, carry out their own ‘best fit’ and determine the grade they would get if they so desire. This puts feedback first. An emphasis on self-assessment against performance descriptors and content-level standards (and goals for improvement or revision). I use command terms all the time: every sheet, question, lesson where possible. Set deadlines with students where possible and am flexible where needed. Track student learning at the criterion-level (MYP objectives), though with current systems (Powerschool), not in great detail at the objective strands (descriptors) level (e.g. A.i, A.ii, A.iii). I do tests over two lessons, giving out a core section in the first, collecting and checking in-between classes. In the next session, this is supplemented with extra questions that should allow students to take at least one more step up. For example, a student struggling with Level 3-4 questions would get more opportunities to get to that level, whereas another who has shown competency will get the next level(s) up. I want to also be able to effectively track every student’s growth in the content standards and develop deeper skills in inquiry (critical reflective thinking). Develop a system for better tracking learning against the individual strands within each criterion (e.g. A.i, A.ii, A.iii). Better facilitate development of student mastery, allowing us to move further away from scheduled lessons and into more effective differentiation and pacing. It would need to allow for retake/redo opportunities for any and all standards that need to be redone – not necessarily whole assessment tasks. It would have to focus student learning on descriptors and standards, not on the numbers, in order to help them move forwards effectively. Students would need to be able to access it and make sense of it intuitively so that they could decide their own next steps even before I do. It would super-duper if the system could produce really meaningful report cards that focus on growth over the terminal nature of semester grading. What would a three-dimensional gradebook look like? @iBiologyStephen Nothing's stopping us, Stephen! Let's invent that 3-D grade book! 'Thoughtful and analysis and reflections here. Thanks. Categories: Assessment, Differentiation, Middle Years Programme, Professional Development, Science Teaching | Permalink. After defining learning and thinking critically and reflectively about the nature of inquiry and why there might be a tension across the MYP-DP transition, I want to think briefly about the learner that crosses that gap, using the obvious metaphor of the fisherman as the learner and the fish as the content, skills and conceptual understandings that the student brings up from MYP to DP. What kind of student do you want to come up to your DP class from MYP? The kid with a boatload of fish or the thinker with the ability to catch more fish? For authentic inquiry (critical, reflective, future-focused, consequence-oriented, ‘what-if’ thought (Elkjaer)) to be successful, students need some fish in their stomachs. We can’t ask good questions of nothing, nor can we evaluate the empty. So content and skills are needed by the student moving into the Diploma Programme. But is it the MYP teacher’s job to pre-teach everything to a DP student? What is important to know and be able to do? What conceptual understandings and approaches to learning are the most advantageous to develop, to ‘clear the path’ for effective learning and success in terminal assessments? What happens if we ‘teach’ our students too much before they get to DP? Two things concern me here: interference and motivation, both of which I need to learn more about as I continue this assignment. The first is the known negative impact of interference: the effect of incorrect or poorly-formed conceptual understandings on future learning. This is outline in Hattie’s Visible Learning and the Science of How We Learn, and is of particular relevance to the thoughtful science teacher; students come up to our classes with a multitude of prior learning (correct or otherwise) that can either help or hinder their learning. If they arrive with a solid understanding of the concepts of evolution (Biology) or energy (Physics), for example, they will be better able to make connections (transfer) this learning as they modify existing patterns or construct new schema. Conversely, if their existing understandings are misconceptions these need to be undone before effective learning can take place, and this is very difficult to do. These misconceptions may come from poor prior teaching, superficial learning (e.g. content cramming) or in the confusion between discipline-specific and everyday use (e.g. ‘power’). I would argue here for a very carefully-constructed conceptual curriculum in the MYP years, one that emphasises not a large body of content but a highly-effective approach to constructing correct conceptual understandings. Parallel to this is the concept of cognitive load and ego-depletion: we need to maintain a careful balance between effective learning to the point of competence and over-exertion to the point of no learning. Knowing is pleasant, but learning is uncomfortable. The ideal student coming up from DP would be fluent in the basic skills, concepts and knowledge that they learned in MYP: the basics of this core curriculum having been automatized and committed to ‘System I’, the ‘fast-thinking’ part of the memory (Kahnemann), leaving cognitive load ready for the heavier lifting in higher-order thinking (‘System II’, slow-thinking’). This is all described with much greater competence in Hattie’s Visible Learning and the Science of How We Learn. This might be a challenge to teachers ‘across the gap’ as the urge to cover content can be a strong one, but perhaps we should rather think of it as developing students who can fish well over those who are paddling upstream with a boatload of rotten trout. The second issue that concerns me is one of motivation. In a highly content-driven, test-focused, behavioural/empirical classroom we risk creating or reinforcing a culture of extrinsic motivation, in which grades are king and are used to positively or negatively reinforce learning behaviours (ego orientation). When everything is accounted for, where is the motivation to learn as a true learner, to be truly inspired to know more? In soe school cultures we might say that it doesn’t matter how the students learn, as long as the results are high, but in that case are we really educating them or are we just passing them on to the next set of accountants? With an inquiry-led, cognitive/rationalist classroom can we develop a more intrinsic motivation to learn, to develop a greater self-efficacy as learners in order to be more critical and reflective in our thought: a mastery goal orientation? How can the MYP classroom develop students effectively through the Approaches to Learning so that they are ready to get fishing as soon as they start Diploma and are carrying with them a solid set of conceptual understandings that will help them transfer their learning and make new connections? Finally, do we really need to pre-teach such a great deal of content in the MYP that there are no new discoveries in the Diploma Programme? How motivated are we to re-learn what we (think we) already know and what is the effect of boredom (coupled with potential interference of misconceptions) on the effectiveness and meaning-construction in what we are trying to learn? Once again the tensions in the transition from MYP to DP represent a fine balancing act, one for which I need to do a lot more learning. Illeris, Knud. Contemporary Theories of Learning: Learning theorists… in their own words. Chapters by Knud Illeris, Bente Elkjaer. Hattie & Yates. Visible Learning & The Science of How We Learn. Categories: Bath MA Int Ed, Hattie / Learning Impacts, Inquiry, Middle Years Programme, MYP: Mind the Gap, Science Teaching, Understanding Learners & Learning | Permalink. This year saw the start of a school-wide push to become more data-driven in our decision-making and evaluation. As a result, one of our goals as teachers at the start of the year was the Student Learning Goal, a target set by groups or individuals based on data collected in school. As a science department we opted to investigate Criterion E: Data Processing in the MYP. We picked this criterion as it is something we have all experiences student difficulty with, it feeds directly into success at IBDP and even with the Next Chapter changes the skills and conventions are likely to remain intact as it is such a fundamental part of the scientific method. Data analysis on data analysis; that’s how we roll. Our initial goal was to analyse the Criterion E scores given in 2011-12 and take actions to improve them in 2012-13, though we realised early on that there were too many uncontrolled variables within the department to make comparisons valid and reliable. Scientists, eh? As a result we shifted this year’s focus to setting up a greater vertical departmental understanding of the elements on Criterion E, as well as preparing resources and exemplars for students. We are confident that the semester 2 data from this year are more reliable, and so will be useful in comparison next year (2013-14) as we take action on our work. Identifying and discussing common student errors and misconceptions. Unpacking the rubrics to make sure we all shared a common understanding of what is expected. This included a lot of vertical discussion about what elements are appropriate for MYP 1 and 3, and I think this was the most powerful part of our work. Identifying commonalities and differences in expectations in MYP and DP Biology, Chemistry and Physics courses in terms of conventions for data processing. Moderating exemplars of student work. Looking up research, journals or articles on student issues in data processing and sharing these with the group, to further discussion and develop strategies to use in our classes. Towards the end of the year we were able to produce a GoogleSlides set of resources to give common advice to students, with exemplars. This is to be copied and edited to MYP3 and MYP1, to meet the adjusted expectations of the interim objectives. As you can see, there is still some work to complete, though it will be ready for action with students in August. Categories: Assessment, Middle Years Programme, Professional Development, Science Teaching | Permalink. In the 1806 of Susanna Clark’s Jonathan Strange and Mr. Norrell, magicians are scholars of magic rather than practitioners. They study magic, wonder where it went and discuss it. 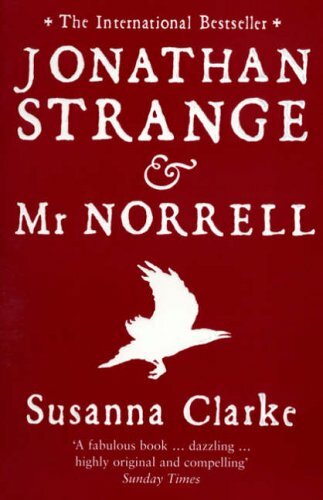 Mr. Norrell is the only ‘practical magician’ in the country, a position he holds dear until along comes Jonathan Strange: first as a pupil, then as a master in his own right. I loved it – all 1,000 pages plus – and one thing that has stuck with me in the six years since I read it was the use of the term magician not as someone who ‘does magic’, but as one who studies, just as an historian doesn’t make history. @13SciDave the tension between being a 'hard' science teacher and the social 'soft' science of education research is a real barrier. If you’re still reading this blog and haven’t read Tom Sherrington’s Guardian article, read it first. Most science teachers aren’t scientists. I’m certainly not, and I can live with it. I’m a teacher. I have friends who are PhD’d up and active in research: they deserve the title. Perhaps I should be called a scientician, in the Jonathan Strange and Mr. Norrell sense. As a non-practicing scientist, a teacher who is responsible for many students, most of whom won’t go into the sciences but may end up in the arts or humanities, I have no right to be a discipline snob. But I do understand the scientific method and I can apply this to education. I love the breadth and currency of science across disciplines and sharing that with students much more than the minutiae of specialism (I think months in a fridge counting cells did that to me). I model the scientific method with my students as we learn about Biology, Chemistry, Physics and Environmental Science, but we are not adding to the canon of scientific knowledge as much as we are marching on to the assessments that will get the students out of school and (perhaps) into universities… where they most likely still won’t be real ‘scientists’ until they near the end of their degrees or become postgrads. I can live with that, too, even though I would much rather free up the curriculum to engage students in ‘real science’. We have some good opportunities in the IB MYP and DP for exploring science, and students from our school are engaged in some interesting self-directed science projects. I hope that as science teachers we’re sowing the seeds and nurturing the roots of scientific inquiry and literacy; that as our students grow beyond our reach our influence remains in some of them and they are engaged in real science. If we have a cognitive surplus that is not engaged in genuine scientific research, then we should harness it to improve education. Maybe one day I’ll earn my stripes as an educationalist. I am actively engaged in my own PD, in ‘experimenting’ with learning in my class and with working on an MA in International Education. As my foundations in educational theory and research develop, these informal ‘experiments’ in my classes will hopefully develop into more controlled and reliable projects. I will admit that my inner qualifications-snob did at first shop around for an education-related masters that gave the title of MSc, but I dropped that soon enough when I realised that the international & education elements were more important to me, my values and my family. I agree that using schools as research institutes could be incredibly powerful PD. We, as science teachers, don’t need to to feel threatened by the perceived ‘soft science’ approach of educational research. Good educational reserach is by no means soft. Just look to the Hattie meta-analysis for evidence of this. * We could take ownership of our own professional development, draw on academic research and apply our understandings of the scientific method, reliability and validity to the work that could take place. The work we produce would be evidence-based, in our own useful context. It would be cognitively engaging and would really count as development – perhaps much more so than the passive forms of PD that tend to be ‘done to’ teachers. There are bound to be challenges to this, though. Masters-level work or real research in schools takes a significant amount of effort. What is clear from Sherrington’s article is that his school is fostering a research environment – it has become part of the school’s values and I find it difficult to see how really effective research could develop in a high-pressure environment. As teachers in international IB schools, we have to live up to high expectations, but I would argue that we have fewer of the significant challenges that might inhibit others: behaviour, funding, the whims of educational governance. I look forward to seeing the research that is produced in IB schools (and through their own Journal of Teaching Practice). I would love to see the sciences lead the way. *The Hattie meta-analysis gets its own post because, you know, blogs. Categories: Bath MA Int Ed, Professional Development, Science Teaching | Permalink.